New media forms don’t emerge in a vacuum. They evolve over time through technological advancements and cultural demands. Cinema is no exception. While some early films may have awed audiences, as a whole, the early film industry had a remarkable amount of similarities to earlier popular entertainments. 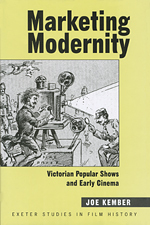 This is the premise behind Joe Kember’s Marketing Modernity: Victorian Popular Shows and Early Cinema. Avoiding a deterministic technological and cultural history of cinema, Kember crafts a fascinating account of Victorian era amusements and attractions that influenced the early British film industry. Kember contends that while early movies offered spectacular material for filmgoers, affirming social norms and introducing people to conceptions of the “modern world”, audiences were not completely naïve to this new medium. By the early 20th century, audiences were sophisticated consumers because of earlier popular entertainments and novelty. Marketing Modernity is a five chapter cultural study that not only provides an excellent glimpse into the Victorian attractions that influenced and existed at the same time as early British cinema, it’s a text that highlights the kinds of institutional and cultural changes occurring alongside the rise of this new media. Kember, senior lecturer in film at the University of Exeter, takes the title Marketing Modernity from the work of British sociologist Anthony Giddens. Throughout the text, Kember focuses on the institutional aspects of modernity, providing examples of how urban dwellers and filmgoers used early cinema to reaffirm self-identity in the modern world. Rather than providing a reductionist understanding of this complex relationship, Kember points out that “early film institutions were able to market modernity successfully not because they passively mirrored the well-known idea that modern sensorial thrived on speed, distraction, and a passion for images; rather, they actively created an opportunity for spectators to exercise their capacity to read such images according to familiar communicative and performative regimes” (8). Focusing on British popular entertainments, throughout the majority of his book, Kember provides a rich cultural history, highlighting how performance, venue setting, audience demands and film subjects/narratives played a role in the ‘turn of the century’ film industry. Kember draws upon early 20th century theorists like Walter Benjamin, Rudolf Arnheim and Béla Balázs to explain how film is an anthropocentric medium, which participates in and contributes to the practices of everyday life. With attention to turn of the century social practices and institutions, Kember outlines the complex cultural arena of the late 19th and early 20th century. British audiences had already become accustomed to magic lantern shows, traveling lecturers, carnival sideshows and other cheap amusements. While early cinema developed out of these traditions, producers, consumers and the social institutions helped shaped the cultural environment and the use of this new media. Kember lucidly states, “producers, exhibitors and spectators in these [cinematic] transactions were each capable of directing the responses of the others, that their varied imperatives were sometimes in conflict, and that they were each, at various points, subject to external industrial, cultural and legislative forces that could be partially determining for all” (38). While Kember spends a great deal of time outlining cultural influences upon early British cinema, he expertly crafts an opening chapter that acknowledges the political and cultural conflicts existing within ‘turn of the century’ England. In order to fully understand and explain earlier popular entertainments, Kember takes a deep dive into the archives and makes excellent use of pamphlets, trade journals and advertisements from the 19th and 20th century. The information coming out of these primary sources serve as both scholarly proof and amusing anecdotes of magic lantern shows and popular lecturing traditions performed in ‘turn of the century’ England. Using these as examples, Kember associates magic lantern and lecture style as a model for how producers felt early film should be exhibited and how audiences expected to be entertained. Kember points out that while the film industry was undoubtedly a new media that helped bring about a new way of living, this medium didn’t appear out of nowhere. Kember explains his title, stating, “‘marketing modernity’ refers to more than the process of allowing audiences to come to terms with the alienation effect popularly associated with everyday life at the turn of the century…early film institutions also participated fully in modernity’s fascination with, and repacking of, very traditional social forms” (214). Rather than just focusing on the innovation and new aspects of the early film industry, Kember also showcases the continuities between older forms of popular culture and the newly established film medium. In addition to archival research, Kember’s study is built off the works of influential film scholars like Tom Gunning, Miriam Hansen and Charles Musser. Kember uses their work as a jumping off point to analyze audience behavior and the evolution of the early British film industry. While a majority of Marketing Modernity highlights the performance and exhibition techniques of earlier eras, Kember also delves into how the film industry evolved from these Victorian amusements. Early films may have been bundled together with popular entertainments, using an authority like a lecturer to introduce and explain films before being projected, but in less than ten years the industry began to shift away from this exhibition technique. Audience sophistication and demand led to the rise of filmmakers, stars, and formal narrative devices that allowed films to stand on their own. Moreover, film production and distribution companies increasingly looked for ways to differentiate their product from others. Rather than looking for subjects that were thought to be popular, these companies sought to create stories and onscreen personas that would appeal to the masses. Kember explains this quick evolution of the film industry, noting, “As in all processes of institutional change, this shift testified to the impact of the creative activities of spectators as much as it does to the significance of institutional constraints” (210). While Kember may take note of the creativity of filmmakers, he points out that the rise of the fictional, narrative film industry was dependent upon audience expectations and market demands. Unlike other histories of early cinema, Marking Modernity focuses upon market factors, audience perception, onscreen performance styles, as well as formal and narrative elements within the films themselves. While the text is a notable cultural history of the popular entertainments, Kember also discusses political and legal problems in the early film industry such as copyright infringement. As a whole, Marketing Modernity provides a useful insight into the development of the early film industry, while also analyzing performance in earlier Victorian entertainments and acknowledging the sophistication of ‘turn of the century’ spectators. Kember’s book is an exceptional resource for students and scholars of early cinema, but is also of interest to those studying new media and emerging technologies. It highlights the complex series of cultural and institutional factors that play into the development of a new technology – insightful commentary relevant to the study of new media in any century.